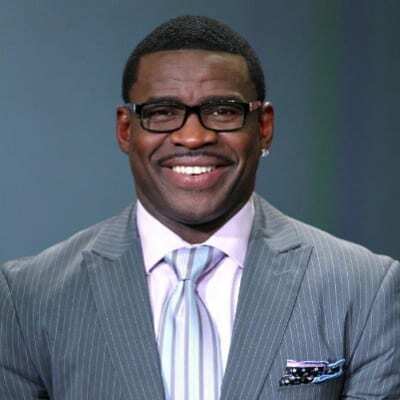 Born on March 5, 1966, in Fort Lauderdale, Florida, football wide receiver Michael Irvin was a gifted high school athlete. After a dazzling high school career at St. Thomas, the heavily recruited Irvin enrolled at the University of Miami. There, under coach Jimmy Johnson, the immensely talented wide receiver set school records for career receptions and receiving yards. He also led the school to a national title. As a result of Irvin’s stellar college career, the Dallas Cowboys selected him with the 11th overall pick in the 1988 NFL draft. Along with quarterback, Troy Aikman, and running back, Emmitt Smith, Irvin recharged what had been a struggling franchise into a perennial title contender and three-time Super Bowl winner in the span of four years during the early 1990s. Over the course of his 12-year career, Irvin registered 750 catches and 11,904, both good for ninth all-time in NFL history. Following his departure from the NFL, the charismatic Irvin jumped into the broadcast booth. He has worked for ESPN and, more recently, the NFL Network.